We recently had a great opportunity to spend a morning together with a wide range of people and organisations, mostly from the Merseyside area, at a workshop organised by the Heseltine Institute for Public Policy and Practice Fresh Thinking Series. 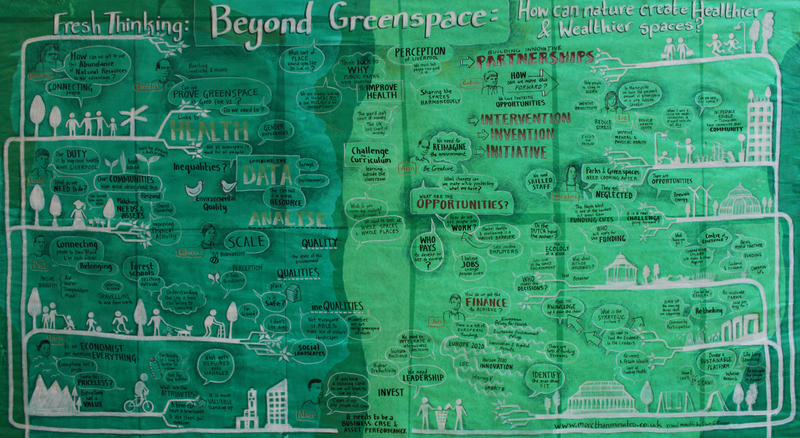 At the event “Beyond Greenspace: How can nature create healthier and wealthier places” we collectively covered a lot of ground on the research, policy and practice angles in Liverpool city region and beyond. We had the opportunity to discuss the Beyond Greenspace project, and related research at the European Centre, and then to consider issues such as the pioneering links between local NHS organisations and the fantastic Mersey Forest. There has clearly been a huge amount of innovative work in the area, such as the Natural Choices project and Mindfulness in Forests. It was encouraging to see excellent collaboration going on between organisations such as the Liverpool LNP (Nature Connected), the regional Academic Health Science Network and CLAHRC, and the Local Economic Partnership. Much of the conversation flowed around to economics, with some passionate debate on how a region can protect its natural heritage and public green/blue space, improve public health and wellbeing, and generate jobs and economic opportunity within a highly restrictive financial climate (HLF’s ‘State of UK Parks‘ provides some useful information on some of the challenges facing UK greenspace managers). Dr Karyn Morrissey of the University of Liverpool, Department of Geography and Planning was on hand to give an excellent perspective on the economics of natural resources. Karyn spoke about the economic valuation of our natural resources as a means of incorporating green and blue assets within the public and private agenda. Whilst, undoubtedly rudimentary (and perhaps crass), the manner in which economists monetise our environment is important to the maintenance of our greenspaces; “what gets measured gets managed”.